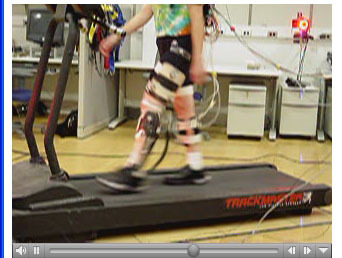 Video 1—A subject performs heel raises with EMG electrodes placed on the soleus muscle. 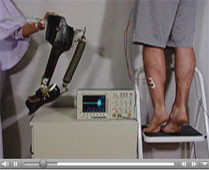 Electromyography (EMG) signals are processed by a computer (not shown) in real time and used to control air pressure supplied to the artificial pneumatic muscle. Video 2—A subject walks during the transition from baseline to powered on day 1. This is the first time the subject experiences the exoskeleton powered. 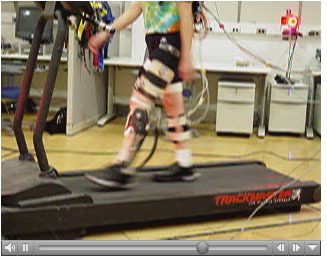 Video 3—The subject after walking continuously with the exoskeleton powered for 30 min. The subject is shown transitioning from powered to post-adaptation on day 1.